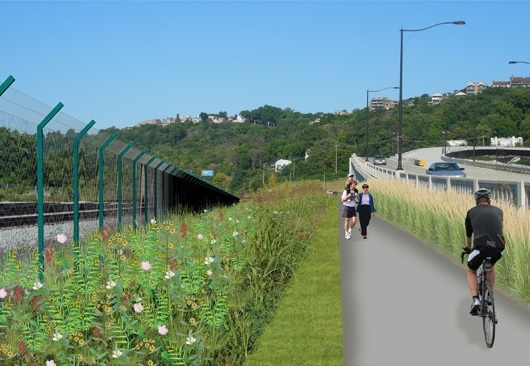 River West Working Group has announced that the western leg of the Ohio River Trail through Cincinnati has been awarded a $1 million Federal Congestion Mitigation/Air Quality grant. An additional funding commitment of $261,000 from the City of Cincinnati’s Bicycle Transportation Program brings the total to $1.3 million. Project leaders say that the money will be put toward construction of the first phase of the bikeway and greenway project along Cincinnati’s western riverfront. “We greatly appreciate the initiative of the City’s Department of Transportation & Engineering in developing and submitting the grant application, and the support of Mayor John Cranley, who set up the bike program funding that seeded the Federal grant,” said Tom Croft, co-chair of River West Working Group. Croft, a Price Hill community activist, also credited the work of ODOT, OKI Regional Council of Governments, State Senator Bill Seitz (R), and Representatives Bill Blessing (R) and Lou Terhar (R). The first phase of work will extend roughly 3.7 miles downriver from the planned Price Landing park to the Gilday Recreation Center. The recently allocated funds will go toward constructing more than half of this phase of work. The overall plan for Ohio River Trail West is a 28-mile bikeway and greenway network, separated from nearby roads, that serves as a connection between Smale Riverfront Park and Shawnee Lookout. The river alignment of this trail makes it unique to any other east/west corridor on Cincinnati’s west side in that it does not traverse steep or extended hills. Such an orientation will allow cyclists the opportunity to get to the trail and have a level path into the city center. Due to the relationship of the project to the existing freight railroad lines, project leaders say that additional coordination is needed before the group is able to move forward with the third segment of work within the first phase of construction activities. “We are not going to announce work on that until we have negotiated some type of agreement”, Dave Zelman, co-chair of River West Working Group told UrbanCincy. Further complicating matters is that the City of Cincinnati recently worked with the freight railroad companies to rebuild the four tracks along that stretch in recent years. Regardless, neighborhood leaders and project proponents are confident that the work will progress and serve as a major benefit for the communities along the corridor.